Doing a Factory Reset on the Samsung Galaxy Note 3 is easy. You don't need to be a tech-savvy to do so. If you are afraid that you might mess up the settings of your phone if you do this, please don't because you're actually doing your phone a favor by performing this procedure. There are actually two ways you can do a master reset on the Note 3. The first one is through the Settings app while the second is via the Recovery Mode. But you should know that the downside of doing this is that you will lose all your personal data such as ringtones, images, contacts, apps and downloaded contents. You should back them up before doing it. Tap Settings, then General tab. You can choose either to do an Automatic restore or Backup my data. To continue with the reset, tap Factory data reset. If you have enabled your PIN or Password, enter it then tap Continue. Tap Delete all to proceed. Turn your Galaxy Note 3 off. Press and hold the following buttons all together: Volume Up, Home and Power buttons. 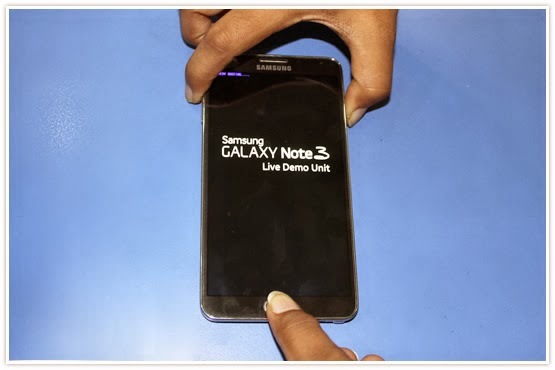 When the Galaxy Note 3 logo appears on the screen, release the Power button but continue holding the Volume Up and Home buttons. When you can see the Android System Recovery on the screen, release both keys. Using the Volume Down key, highlight 'wipe data / factory reset' option. To select it, press the Power button. Use the Volume Down key to highlight 'delete all user data' option and press the Power button to select it and proceed with the reset. When the Factory Reset is completed, 'Reboot system now' option is highlight. Just press the Power button to restart the phone. NOTE: It will take longer than usual for the Note 3 to boot up after the master reset so you need to be patient and wait until the phone is up and ready.